You are here: Home / Blog / ramblings / What are the most popular live casino games? One of the nifty features of some live casino game lobbies these days, is a display telling you how many players are currently playing each game (or table). Both Evolution and Playtech live game lobbies offer this feature. Log onto any live casino carrying their games you can see exactly how many players are taking part in the game real time . For live blackjack tables it’s a useful number to distinguish quiet and busy tables and therefore how long each game round will be. Or whether you can get a seat or must settle for betting behind. For poker games with shared jackpot side-bets it gives you an indication as to how small or large your share of any jackpot is likely to be. That is of course in the very unlikely event that one of these shared jackpots goes off! But for most other live games, which play exactly the same (from each player’s point of view) irrespective of how many are taking part, the number is simply a curiosity. A thing of interest. But one of the interesting things this little number tells us is which of the currently available live dealer games are most popular. Evolution now include a Top Games category in their live games menu listing the most popular games at any given time. The above screen grab was taken on a typical weekday afternoon (EU time). But it is reasonably representative of what you will find most times. This now seems to be, that the soft gambling games (or Game Show games Evolution calls them) are very, very popular. Lightning Roulette (943 players), Dream Catcher (531) and Monopoly Live (263) are now regulars on the Top Games category. Good to see the old classics in live roulette and baccarat also there. I suspect the popularity of the Casino Hold’em table is presently boosted by that nearly €£ 2.5 million jackpot. Over at Playtech it’s the Asian studio live roulette tables that are leading the charge. Diamond (243 players), Pearl (165) and Phoenix Roulette (91) are European and French tables live streamed from their Manila studios. Perhaps it was a timing thing (late evening Asia versus early afternoon EU time), but these tables had significantly more players on them than the Latvian studio tables. Spin A Win (76 players), Playtech’s answer to Dream Catcher is also among their most popular live games. So the rise of the soft gambling games isn’t just an Evolution Gaming phenomenon. 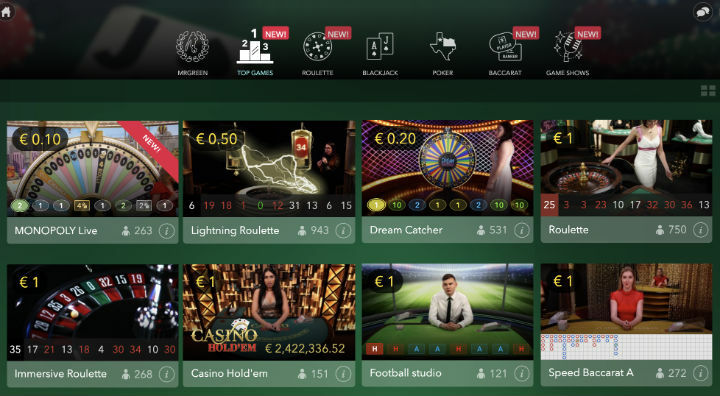 Surprisingly, the player count at bet365’s private live roulette tables were right up there. Quite amazing given the above tables can be accessed by players logged into dozens of Playtech licensee casinos. This gives you some idea of how significant a client of Playtech bet365 are. In case you are wondering why no blackjack tables are represented here, the reason is simple. It’s not a one-to-many game. A classic 7 seat live blackjack table is full once 7 players are seated. That’s why the bigger casinos have many live blackjack tables for players to choose from. To gauge its popularity you’d need to add up all players at ALL blackjack tables at any given time which would be a difficult thing to do. But probably safe to say that if you did do this, the number would quite comfortably put it into the Top Games category.